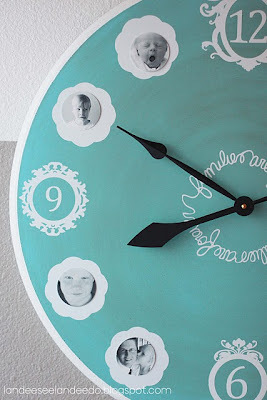 I love this clock that Landee See, Landee Do linked up to Show and Tell Saturday. I love the family pictures in place of the numbers. It would also be helpful to tell little ones when they had to go to bed. When the little hand is on your brother and the big hand is on your dad you have to go to bed. Oh, and it is beautful too! Check out the tutorial HERE and check out all of the other great projects being linked up HERE. Reminds me of the clock I put together a few years back.. except I'm falling in love with the colors in this one! One can never have too many family clocks right?